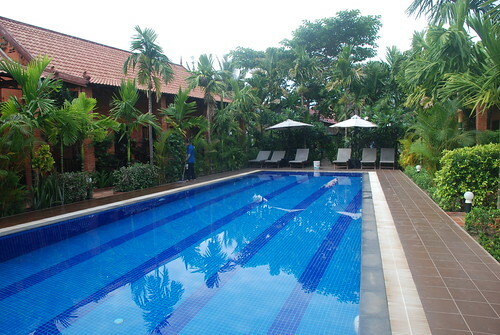 We took a day off from sightseeing to relax at the hotel pool and walk around the town, the old market and try some specialties of Siem Riep. Even though the weather was very hot my family loved the friendly atmosphere, nice people and the food from the old market. One of the highlights of the trip for me was that my mother, for the first time ever, at more than 70 years of age, got into a swimming pool to swim and she can swim every well. My nephew, my sister and I told her to walk into the pool to let her feet relax and take some photos with my sister. Then we pulled her into the middle of the pool for a bit of paddling. Truly a great moment to see! 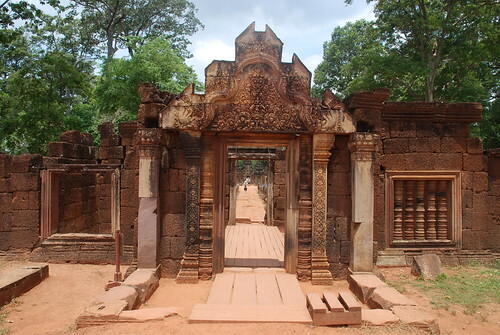 On our last day at Siem Reap, our tuk-tuk driver Pheav took us to visit Banteay Srei Temple which has some of the most beautiful stone carvings in the world. This temple is about a 45 minute jouney by tuk-tuk from Siem Reap but we got a really good look at rural life in Cambodia along the road. My mother loved this temple the most because because of the carving and she was very impressed at the Cambodian government's efforts to maintain it so well. As UNESCO world heritage sites, they are obviously a very important source of revenue for the country. 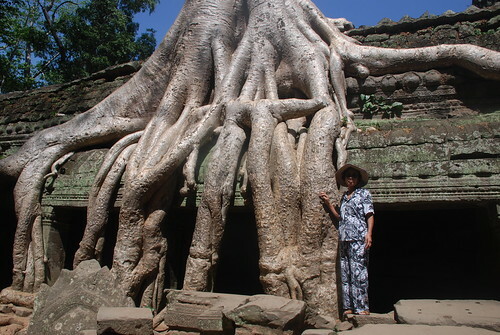 Our next stop was the Ta Prohm Temple. My sister and my nephew couldn't believe those amazing huge trees growing throughout the temples and how nature and man's structures could become like one. We noticed this time that lots of restoration work was being carried out and that many foreign organisations help out. 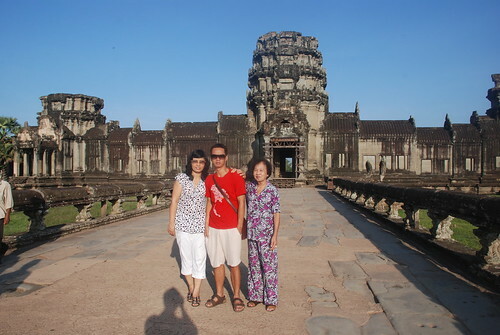 Anyway, my family's visit to Siem Reap was great. We all learnt something new, about the different culture, experienced the beauty of the great temples and the charm of the Cambodians. The best thing from the trip was seeing the happiness that my mother showed after so many years of her working and sorting out the difficulties of our lives. Can't wait to make another trip somewhere next year with her. Thanks to the Central Boutique Angkor staff and especially Mr Pheav for giving my family some great times in Siem Reap!!!!! In Rome, we returned the rental car after at least an hour of driving around lost with nothing but a useless Lonely Planet map. We scouted around central station for a hotel, eventually locating one in an old style building on the fifth floor. We bought hop-on-hop-off bus tickets to visit the famous places around Rome and it was really worth the money. It was a good way to get a first overview of the city before we started the real discovery on foot over the following days. 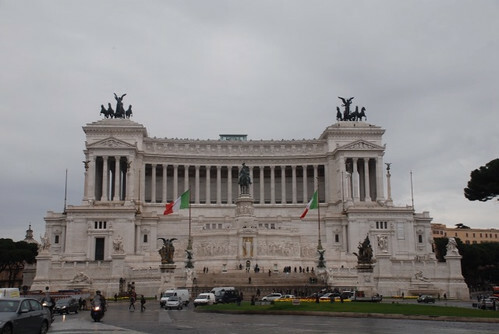 I loved the Victor Emmanuel Monument and kept coming back to it. Even though it's way different and not as ancient as other famous buildings in Rome,it was my favourite. It's a magnet for tourists and difficult to get a good photo. 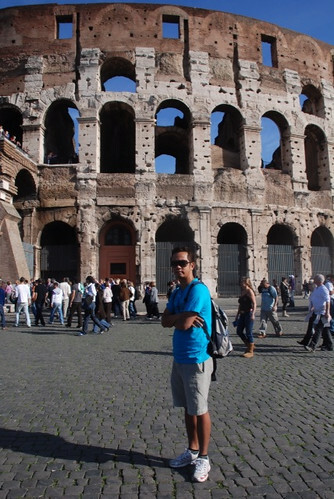 On our second day, we made our way to the Colosseum. And I had to pinch myself because I couldn't believe I was standing in front of it. The surrounding outside wall looked amazing but unfortunately we couldn't make it to visit inside as the queues were at least 2 hours long and Rome is so much more than one building. Good reason to come back :). So we walked around the Colosseum and I did a silly tourist thing and had my photo taken with the guys in Roman costumes. It was fun but expensive (€15, I think). My friends thought I was crazy but how many chances in your life to do that and look at the photo at the end of the trip, it was a highlight :). 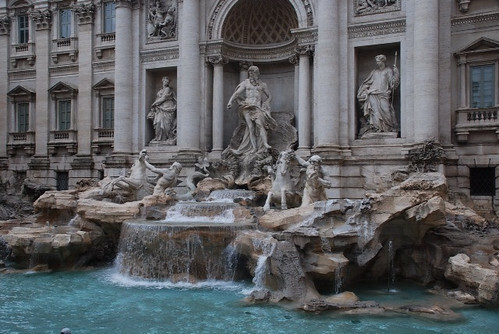 The Trevi Fountain was another highlight and, like everything in Rome, it was packed with tourists, particularly Japanese. We threw coins into the fountain before heading to Piazza Navona, an amazing space filled with fountains and artists and restaurants. When I travel, I like to have things to remember places by so I bought some paintings. We sat down in one of the many restaurants for lunch and watched the artists at work. 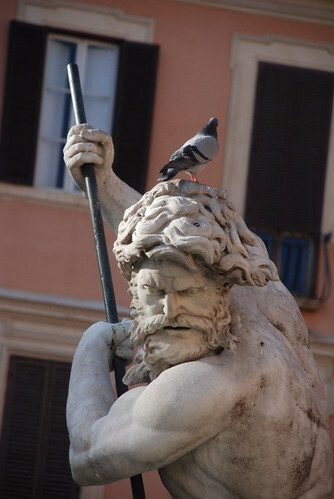 The statues by people like Bernini are, of course, incredible! The next day I walked past the Lazio football club and I told myself that it would be a be crazy to miss an opportunity to see a match while in Italy. Luckily for me, five days in Rome coincided with the local derby between Lazio and AC Roma. The match wasn't that tough but the fans and the atmosphere was so great. I've watched football in Vietnam alot but I enjoyed this so much more. My friends aren't that keen on football so they went to visit museums and other places which is fair enough and they had a good day too. 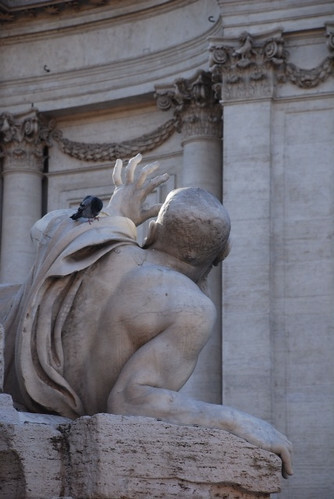 There are so many things to say about Rome. It's impossible to know in only five days. Five months would not be enough! Street plant vendors are very common now in Hanoi in addition to the more noticeable flower sellers. After getting cheated a few times, I now know to check the plants very carefully before finalising any purchase from these vendors. Just remembering how I got cheated makes me feel silly but I do admire their endeavour, even though it's clearly not right. At that time, as is my habit, I was sitting in front of Cafe Nang listening to the different conversations going on around me. I saw the plant vendor ride her bike past on the back of which was a very beautiful small bonsai covered with many gorgeous red flowers. After a round of bargaining, I thought I got a good deal. In fact, most of the customers in the cafe admired my bargaining skills and the flowers on the plant. Of course, two days later the flowers were dead. My friend checked them and we realized that the flowers had actually been pinned on, every single one of them. Hate that. Another time, I got off my bike just opposite Cafe Nang, and noticed another seller with beautiful fire cracker flowers. I bought two plants and got them home safely. I went down to the Red River flats near my house to buy two new pots to plant them in. Great job, I thought to myself as I sat admiring them with a cool drink. Unfortunately, the next day the same friend pointed out that I'd been scammed again. This time the flowers had started to go moldy and I realised they'd been stuck in using elephant glue and I was so disappointed.